We’ve all been hearing for years how much more eco-friendly it is to take the train than it is to drive – but this is the car that could change that. 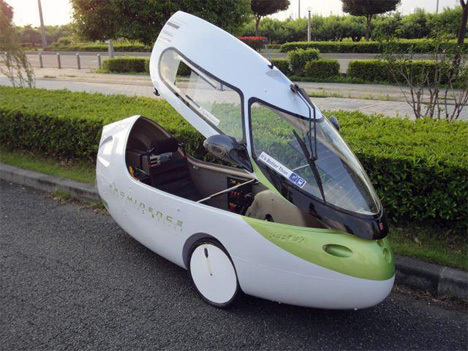 The Prominence Commuting Device is an ultra-compact electric vehicle that is not only street-legal (at least in Japan) but beats the train on CO2 per-person emissions. 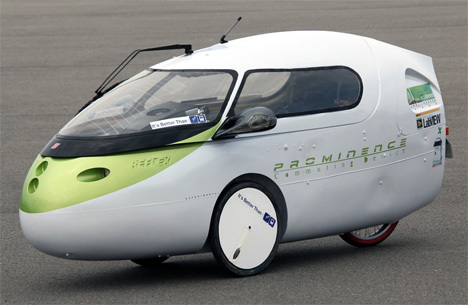 Built by solar car racing group Team Prominence, the PCD is made from parts that are readily available to people who want to follow the team’s lead and build their own tiny electric vehicle. The little powerhouse can travel 90 km (56 miles) on a single charge and the battery takes just four hours to charge completely. Sporting only three wheels and one seat, the PCD is definitely a commuter vehicle and not a family car. Rather than regular side-opening doors, the PCD features a hatch that lifts up to allow passengers access. This definitely adds to the vehicle’s futuristic looks. 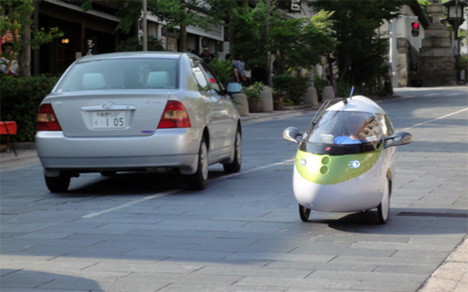 Although the PCD can reach speeds of up to 46.6 MPH, it is classified as a motorized bicycle/small motor car, which means that on Japanese roads it is only allowed to go up to 37 MPH. Which, after you see its tiny size next to regular cars, seems like a good thing. A collision at higher speeds (or with a very large vehicle) would be totally devastating to anyone in the PCD. See more in Mods & Custom or under Transportation. April, 2012.